This interesting name is of early medieval English and Scottish origin, and derives from the medieval Anglo-Norman French term "petit", small, a word of obscure and isolated origin, thought to be a "nursery word". It was used as a nickname for a small person, as in the recording of Walter le Petiit, in the Wiltshire Assize Rolls of 1249, and also to distinguish the younger of two bearers of the same given name. The term was also used as an element in medieval surnames developed from personal and occupational - or nick - names, as in Walter Petitclark (1304, Gloucestershire); John Petijohan (1327, Sussex); and John le Petit Smyth (1351, Essex). 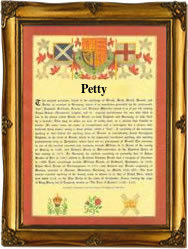 The surname from "petit" is first recorded in England in the late 12th Century, as below, and can be found in forms ranging from Petty and Pettie to Pe(t)it, Petyt, Pettitt and Pittet. In Scotland, one Fergus de Pety in the parish of Fyvy was excommunicated in 1382, and Master Duncan Petit or Petyt was archdeacon of Glasgow in 1395. The marriage of John Petty and Margaret Rogers was recorded at St. Dunstan's in the East, London, on June 22nd 1568. A Coat of Arms granted to the Pettys of Warwickshire depicts, on a shield divided quarterly gold and blue, on a green bend three gold martlets. The first recorded spelling of the family name is shown to be that of William Petie, which was dated 1198, in the "Feet of Fines of Nottinghamshire", during the reign of King Richard 1, known as "Richard The Lionheart", 1189 - 1199. Surnames became necessary when governments introduced personal taxation. In England this was known as Poll Tax. Throughout the centuries, surnames in every country have continued to "develop" often leading to astonishing variants of the original spelling.